Use invoicing software that matches your impeccable sense of style. Use Zoho Invoice. Create an invoice template that resonates with your brand. Customize rows and columns, add your brand logo, rename labels, and make an invoice that works for you. Accept online payments from your clients via a payment gateway of your choice to ensure a healthy cash flow for your business. Don't lose money on late payments. Send payment reminders at intervals of your choice and acknowledge prompt payments with thank-you notes. Don't rely on memory to tell you where most of your money is going. Whether it is photo shoots, advertising space, or raw materials, know where you are spending the most with comprehensive reports. Let your customers know how much the custom made dresses would be, using clear estimates. Provide appropriate discounts, explain the terms and conditions of your business, and let your clients make changes if necessary. Track time for your offsite photoshoots using the mobile app. Zoho Invoice automatically adds your unbilled hours and billable expenses to an invoice with one click. When the whole world loves your designs, don't let your invoicing software from selling it across the globe. 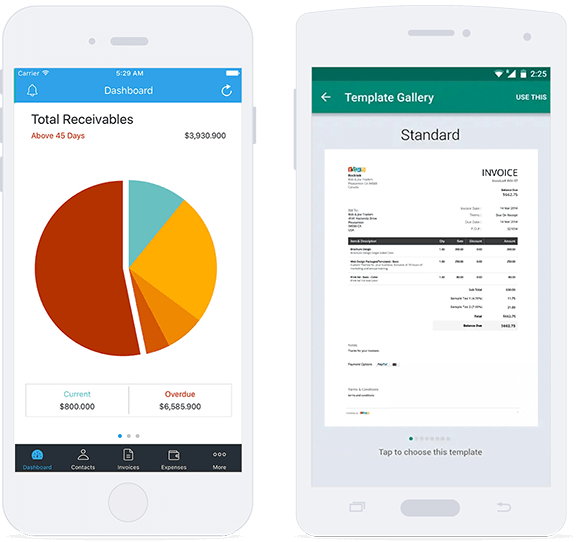 Zoho Invoice lets you bill your customers in their local currency and automatically converts it to your base currency, making accounting easy. With our exhaustive reports, you get a clear idea of how your business is doing and make informed decisions on spending. Need help? We are available 24x5 on call, chat, and email to ensure that you get the best experience while using Zoho Invoice.